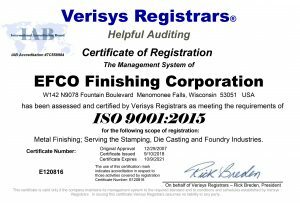 EFCO Finishing is excited for the upcoming year and for the opportunities in front of us as metal finishing service provider and Wisconsin business. Entering our 71st year of operations, there are uncertainties in the world – both manufacturing, business, and otherwise – but there is also a cautious feeling of optimism. I have held out on these projections until we could talk to a wide variety of our customer base, and here is what our customers are telling us. Dealing with as many customers as we do, ranging from metal stampers to die casters to fabricators, tool and die, and too many more to mention, there is not a true consensus. Many feel a sense of optimism, especially in light of the defense contract awarded Oshkosh Defense. Yet others are pessimistic, especially if they serve the Agriculture, Oil and Gas, or Mining Industries. While it is an obvious windfall to have cheap gas at the pump, it is apparent the low cost, and continually plummeting price, of oil is affecting our economy in a negative way. The quoting activity for many businesses and industries seems to have slowed a bit entering the new year, yet there are some that have stayed very busy. The Food and Beverage along with Medical industries are good examples of these. Many factors have business owners and executives on edge, from the uncertainty of the upcoming election to healthcare and taxes, and on a more global front, terrorism. Any number of factors or events could alter everything, and throw all projections and forecasts to the wind. At EFCO Finishing, we remain upbeat about 2016, as we hope to build on a more positive second half of 2015. Dealing with the wide range of customers that we do, we are focused on building relationships with these companies, to be a true partner and resource for them. What we do best is provide timely services, such as vibratory finishing, ball burnishing, glass bead blasting, steel grit and steel shot blasting, degreasing, polishing, and more, which allow our customers to focus on designing and producing parts, which is what they do best. We wish all of our customers and friends the best of luck as 2016 gets rolling. Please contact us if we can help you in any way! EFCO Joins the Tool, Die and Machining Association of Wisconsin! Effective at the start of 2016, EFCO Finishing has officially joined the the Tool, Die and Machining Association of Wisconsin (TDMAW). Along with serving as a resource for the organization, EFCO looks forward to the many networking, educational, and customer interaction opportunities. The TDMAW was established in 1937, so it is a well established organization with firm roots in the community, similar to EFCO, which dates back to 1945! EFCO, a metal finishing company in Butler, is a job shop focused on the deburring of parts, offering vibratory finishing, ball burnishing, steel grit and steel shot blasting, glass bead blasting, blastroom blasting, degreasing, polishing, and many more services. Different from the typical member who is a tool and die or machine shop owner, the organization amended its bylaws to create a new category of membership focusing on outside services. 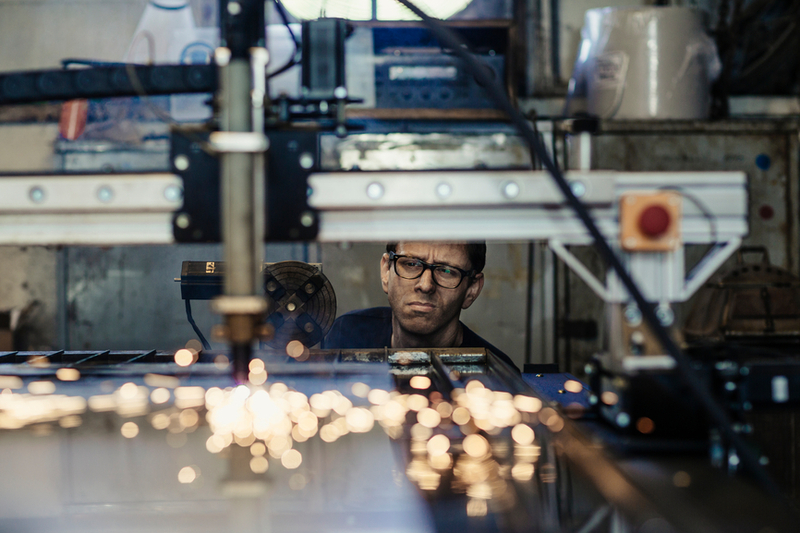 This fits well with the EFCO model, which is to be a metal finishing resource for our customers, offering advice and solutions on a wide variety of different needs. The year started off with a meeting January 5th at Alioto’s in Wauwatosa, with Cathy Stepp, Wisconsin’s Department of Natural Resources Secretary, informing the group of what is happening on both the state and national level regarding regulatory and environmental issues. Secretary Stepp, with her background in the private sector, was well received by the group with what she emphasized as a common sense approach to doing business. Both she and Governor Walker continue to challenge the organization on ways to do things more efficiently, and effectively, for the business community and the citizens of Wisconsin, who are the DNR’s customers. Terry is looking forward to meeting more of the group at future meetings, and participating in other events as they come up. EFCO Finishing recently joined the Family Business Legacy Institute (FBLI) in 2016. In business now for over 70 years, and in its third generation of family ownership, EFCO is continually striving for improvement and growth, and to preserve and enhance its legacy. Being part of a family business presents unique challenges and opportunities, and the FBLI’s mission is to help navigate these, with its focus being on family, faith, and business. FBLI provides networking opportunities, educational programs, and access to valuable partners and service providers, one of which is Concordia University in Mequon, combined with fun and unique events. Consultation opportunities are also available. Listen to Terry Schultz, president of EFCO, in the following commercial recorded at service partner Milwaukee Radio Group. It will air on WKLH, 96.5 FM, during the month of January, to promote the FBLI.